Flour Tortillas, hard corn taco shells, corn tortilla chips, taco seasoned ground beef, shredded chicken, pork carnitas. Additional sides include Spanish rice and vegetarian refried beans. Toppings include cheddar-Monterey jack cheese shredded, diced tomatoes, shredded lettuce, house made guacamole, fire-roasted salsa, chili-Verde green salsa, pic de Gallo, black bean and corn salsa, jalapeño-lime corn, taco sauce, sour cream, black olives, jalapenos, and sliced green onions. Carmel filled churros with chocolate dipping sauce. Served with freshly brewed Ice Tea, Lemonade and water. All service ware, including plates, cutlery and glass come with catering. * Ask about our gluten-free options. Grilled chicken and steak fajitas with sautéed onions and mixed bell peppers, plus all the trimmings. 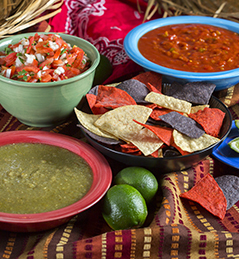 Corn and Flour Tortillas and corn tortilla chips Additional sides include Spanish rice and vegetarian refried beans. Toppings include cheddar-Monterey jack cheese shredded, diced tomatoes, shredded lettuce, house made guacamole, fire-roasted salsa, chili-Verde green salsa, pic de Gallo, black bean and corn salsa, jalapeño-lime corn, taco sauce, sour cream, black olives, jalapenos, and sliced green onions .Freshly Baked Cookies Served with freshly brewed Ice Tea, Lemonade and water. All service ware, including plates, cutlery and glass come with catering. * Ask about our gluten-free options. Flour Tortillas, hard corn taco shells, corn tortilla chips, taco seasoned ground beef, shredded chicken, pork carnitas. Rolled Cheese Enchiladas with classic red enchilada sauce. Additional sides include Spanish rice and vegetarian refried beans. 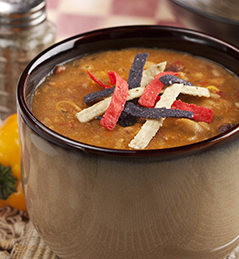 Toppings include cheddar-Monterey jack cheese shredded, diced tomatoes, shredded lettuce, house made guacamole, fire-roasted salsa, chili-Verde green salsa, pic de Gallo, black bean and corn salsa, jalapeño-lime corn, taco sauce, sour cream, black olives, jalapenos, and sliced green onions. Freshly Baked Cookies. Served with freshly brewed Ice Tea, Lemonade and water. All service ware, including plates, cutlery and glass come with catering. * Ask about our gluten-free options.